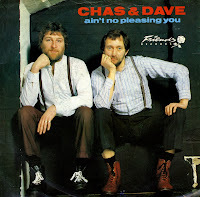 One month ago today, Chas and Dave announced their split. Dave Peacock decided to retire from the music business after the death of his wife Sue in July. Chas Hodges will continue to perform live as Chas and his band - honouring touring commitments the duo had already made. Their last chart hit in the UK was 'Snooker loopy' from 1986. One of their best singles is 'Wish I could write a love song' from 1983 - but that one did not chart. The B-side, 'That's what I like' was covered in 1996 by Tori Amos. At the age of eleven, just before I was leaving junior education, the school organised a dance for its pupils. The memory of dancing with the girl Francisca had left my mind for a long time, but it came back when I heard this song, because this was the song we danced to. I left school full of hope for the future, but it would take no less than 11 years before I ever danced with a woman again. 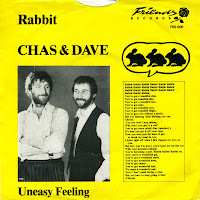 It was Chas & Dave's only hit in the Netherlands, reaching number 20 in May 1982. In the UK, where the duo was more successful, this was their biggest hit, peaking at number 2 in the singles chart the month before. I knew a girl once who was always talking. She talked so much that my ears, and those of our mutual friends, started to bleed. I had to do something, and that's when I reached back into my record collection and recorded this song for her. It's got the great lines: Now you were just the kind of girl to break my heart in two / I knew right off when I first clapped my eyes on you / But how was I to know you'd bend my ear'oles too / With your incessant talking? / You're becoming a pest. When I asked about it, she confessed that she never really listened much to lyrics of songs, just the music. And so this little hint went right past her. I bought the single a decade earlier, just because I liked it. 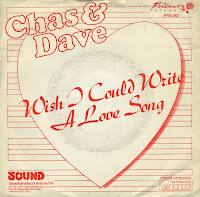 I never heard much more about Chas & Dave until Tori Amos covered two songs of theirs in 1996.